Seems Even Better is one of two entries for AQHA Racing all-time leading owner Ed Allred in Friday's $18,000 The Blink Of An Eye Handicap at Los Alamitos. LOS ALAMITOS, CA—JANUARY 27, 2019—Winning streaks and perhaps the track record will be on the line when racing fastest dash, the $18,000 The Blink Of An Eye Handicap at 100 yards headlines the 8-race program on Friday night at Los Alamitos. First post is 7 p.m. Fans are reminded that Los Alamitos will be dark for live racing on both Saturday and Super Bowl Sunday. Live racing will resume on Friday, February 8. Owner Ed Allred, the sport's all-time leading owner, has two entrants ready for the Blink Of An Eye including the reigning track record holder La Sierran. To be ridden by Vinnie Bednar for trainer Scott Willoughby, the Stel Corona filly won an allowance event at this distance in a track record mark of :06.48 on October 20. She came back to run second to Kiss N Air's :06.58 winning time on December 1. The two will meet again in Friday's Blink Of An Eye. Allred and Willoughby will also be represented by Seems Even Better, a winner at 100 yards on November 11. Owned by Alberto Rosilles, Rite Quick will enter the Blink Of An Eye Handicap with a three-race win streak that includes a pair of 330-yard races plus a convincing half-length victory at 100 yards. His last effort was also impressive, as he posted a daylight victory at 330 yards. K&R Allred Ranch, LLC's The Cartel Hawk has won his last two outs and both have been nose decisions at 100 yards. He has led every step of the way in both of those gutsy efforts. He'll now take on wide-open and tough field of lightning quick sprinters. Kolleen Ledgerwood's Kiss N Air, a winner of five races in her career, had won three straight outings before lacking racing room when finishing ninth in her first start of 2019 on January 6. 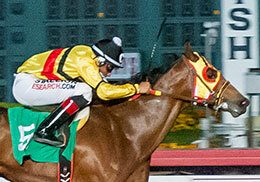 Wild West Futurity finalist Jodee B Valiant is another top runner set to race in the Blink Of An Eye. Cesar Dabdoub's Ali Babe Foose, the runner-up in the Grade 1 Los Alamitos Two Million Futurity, was impressive on Tuesday morning when posting a 220 yard turn-and-work in :12.3. The Foose colt was named the 2018 PCQHRA champion 2-year-old colt. Howard Nichol's Dexxter, eighth in the Two Million, worked in :12.60 on Tuesday as well.